The duck breasts we have had for Christmas dinner for the last few years require quite a bit of organisation beforehand if Christmas day is to be hassle free. The breasts themselves are not difficult to cook, even if this method, (which I have borrowed from Tetsuya Wakuda) involves moving them from a frying pan to the oven to the griller. It is the sauce (or gravy, or jus) that presents the problem. The breasts release a good deal of fat (which should be kept), but very little else that will help you to begin making a good sauce. They do release some juices when they are resting and these are, of course added to the sauce. It is a little late to begin, though, when the breasts are about to be served. If you already have some homemade chicken gravy as a starting point, things become much easier. It really is worthwhile cooking a chicken during the week before Christmas for this express purpose. Have demi-glace on hand, bought or homemade, homemade chicken stock, a bottle of Grand Marnier and a made-up quantity of orange sauce base. The orange sauce base gives the sauce depth. Zested orange peel is an optional extra. You can also make up the glaze beforehand. If you have done all this and then find at the last minute that the shop from which you have ordered your duck breasts has itself forgotten to order duck breasts, (which has happened to me two years in a row), you can be forgiven for having a nervy turn! Last year, the only place that could help me at short notice was Black Pearl Caviar, really desperation stuff! The bonus was that the breasts (magrets) were from ducks with the most obscenely large breasts. They were expensive but absolutely delicious. I think the moral of the story is to buy your breasts a couple of weeks before Christmas. Chances are they will be frozen anyway and they might as well sit in your freezer as in somebody else’s. Caramelise the brown sugar and malt vinegar together in a saucepan, then carefully add the strained orange juice. Simmer, then cool. Combine soy sauce, brown sugar and mirin in a saucepan and stir until sugar has dissolved. Set aside. Line griller tray with foil and preheat oven. Trim the duck breasts and season with salt and freshly ground black pepper. Brown breasts, in batches, skin side down, in the grapeseed oil in a non-stick frying pan. When the skin is dark brown and crisp, turn to cook the flesh very briefly. Reserve the fat for another use. Transfer the breasts to a baking dish and place in the oven to cook for another 5 – 6 minutes depending on the size of the breasts. Remove from oven, place on a warm plate, cover with foil and allow to rest. Strain off all but a little fat from the baking dish, add a little plain flour if there is sufficient duck juice to warrant it. Add chicken stock and make a light gravy. If insufficient duck juice, omit this step. Place duck gravy (if any), prepared chicken gravy and orange sauce base in a saucepan with a little chicken stock and bring to the boil. Add Grand Marnier and 1 tablespoon demi-glace, reduce heat and simmer gently. Check seasonings. 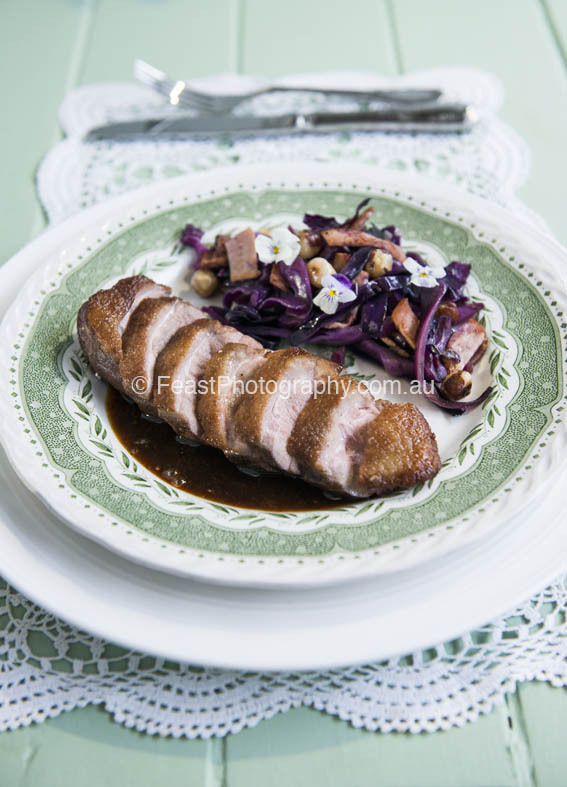 Remove duck breasts from foil, carefully pouring any accumulated juices into the sauce. Place breasts, skin side down, on foil covered grill tray and paint each breast with glaze. Brown lightly. Remove from grill, re-paint with glaze and replace under grill. Repeat one more time, each time being careful to remove the duck before it burns. Cover breasts again with foil. Check the sauce and add zested orange rind, if using. Spoon jus onto serving plates and top with duck breasts, skin side up. Serve with roasted potatoes and red cabbage.